Eternal Darkness: Sanity's Requiem (aka Eternal Darkness: Manukareta 13-nin in Japan) is a psychological horror video game released for the Nintendo GameCube, developed by Canadian developer Silicon Knights and originally planned for the Nintendo 64. It was the first video game published directly by Nintendo, rather than a third-party developer, to be rated M for mature by the Entertainment Software Rating Board. 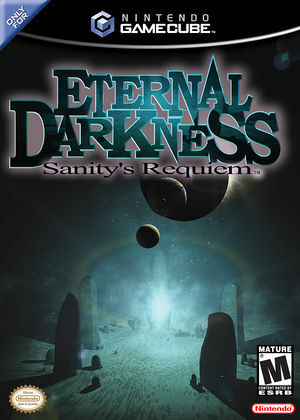 Eternal Darkness: Sanity's Requiem has a native 16:9 display option, but it requires enabling it in its internal options and setting Dolphin's Aspect Ratio graphics setting to "Auto". Using the widescreen hack with this title is not recommended. Since 5.0-5745, textures in Eternal Darkness: Sanity's Requiem will appear blurry in the distance at internal resolutions above native, due to false positives in Arbitrary Mipmap Detection. Since 5.0-8296, this setting can be disabled to work around the issue. However, if any "mip trick" effects are used by the game, they will not work correctly. Before and after a chapter, the screen momentarily turns green or purple. Prior to Hybrid XFB in 5.0-5874 turn on Real XFB or after disable "Store XFB Copies to Texture Only" to avoid this. While pausing the game, the aspect ratio can momentarily stretch to each side with default settings, causing a distorted image. Disabling Dual Core corrects this. See issue 10801. Since 5.0-69, Dolphin will hang in Dualcore and SyncGPU modes when the Edgar Allen Poe quote displays. Refer issue 9706. Use Deterministic GPU or Single Core to avoid the issue. Deterministic GPU is now set by default as of 5.0-4788. The graph below charts the compatibility with Eternal Darkness: Sanity's Requiem since Dolphin's 2.0 release, listing revisions only where a compatibility change occurred. r7128 Windows XP AMD Athlon II x2 215 @ 3.45GHz NVIDIA GeForce 7025 Game completed (green part) - with 35-55FPS (65-90% of speed). Used usual (JIT) recompiler! All intro video is working, with sound. r7283 Windows 7 Intel Core 2 Duo E4500 ATI Radeon HD 4760 Game runs beautifully! I was using the experimental JITIL compiler. All graphics render properly and the game produced little to no lag at max video settings. The only issue i had was when the piano/organ/ maid character sounds played, they would continue to play until you reloaded the game or a new scene was played. 3.0-415 Windows 7 Intel Core i7-2600K NVIDIA GeForce 570 GTX Cutscene audio was heavily distorted and unintelligible, otherwise ran perfectly at 1080p with max settings. 3.0-636 Windows 7 Audio either absent or pure static in DSP HLE. DSP LLE doesn't function (emulator closes immediately on launch). Occasional graphic glitch in some cutscene. 4.0 Windows 7 AMD Phenom X3 8650 @ 2.3GHz NVIDIA GeForce 9800 GT Most of the game runs at a full 60FPS with almost no graphical issue. However, any on-screen enemies will result in slowdowns, audio during cutscenes lags and cuts a lot, and transitions between chapters cause a momentary green screen. Graphic settings is OpenGL, 1x native, 0x AA, and 1x AF; audio settings is DSP LLE. 4.0.2 Windows 7 Intel Core i5-4570 @ 3.2GHz NVIDIA GeForce GTX 550 Ti Performance was perfect -- no lag during normal gameplay, battles, or cutscenes. There is a bit of a 'green tint' whenever a chapter ends, but otherwise no noticeable graphical flaws. Settings are Direct3D11, 2x native, 0xAA, 1xAF, JIT recompiler, and DSP HLE. This page was last edited on 28 March 2019, at 06:51.